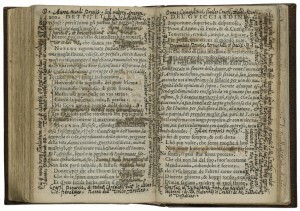 The Johns Hopkins University’s Sheridan Libraries, in partnership with University College London’s Centre for Editing Lives and Letters (CELL), and the Princeton University Library, have been awarded a $488,000 grant from the Andrew W. Mellon Foundation to implement “The Archaeology of Reading in Early Modern Europe.” This new digital humanities research initiative will explore historical reading practices through the lens of manuscript annotations preserved in early printed books. The Principal Investigator for this international research project is Earle Havens, the William Kurrelmeyer Curator of Rare Books and Manuscripts at the Sheridan Libraries, who will work closely with two of the world’s leading scholars of the history of reading, co-Principal Investigators Professor Lisa Jardine, Director of CELL at University College London; and Professor Anthony Grafton of the Department of History at Princeton. The Sheridan Libraries encompass the Milton S. Eisenhower Library, the Brody Learning Commons, the Albert D. Hutzler Reading Room in Gilman Hall, the John Work Garrett Library at Evergreen Museum & Library, and the George Peabody Library at Mt. Vernon Place in Baltimore. Together these collections provide the major research library resources for Johns Hopkins University. The libraries were rededicated in 1998 to reflect the extraordinary generosity of Mr. and Mrs. R. Champlin Sheridan.